Nebraska Cold Storage has been placed in a Severe Violator Enforcement program for failure to develop and implement written, and proper operating and/or mechanical procedures as well as a lack of safety measures regarding physical contact or airborne exposure to anhydrous ammonia – a flammable and explosive chemical that is widely known for hazardous situations. An inspection in March has led to $132,800 in proposed fines. Nebraska Cold Storage provides storage and shipping services for frozen, refrigerated and perishable food industries. Clients of Nebraska Cold Storage includes Tyson Foods, ConAgra and Gibbon Packing. Improper exposure from ammonia can cause serious fire hazards, risk to employees and food contamination. OSHA’s director in Omaha states, “Ammonia is considered a high health hazard because it can be corrosive to the skin, eyes and lungs. It is flammable at varying concentrations…businesses that handle hazardous materials must take precautions to protect workers from exposure to chemicals, explosions and fire hazards”. Fire proof storage containers by US Chemical Storage provides industry leading safety, security and 100% compliance for storing flammable materials. Fire rated or fire proof storage containers are specifically designed to handle flammable hazmat properly, while keeping the external environment safe. In the event of a fire, fire rated storage containers provide the safety to evacuate the facility or surrounding area with complete security. US Chemical Storage offers fire proof storage containers that are designed by experienced, professional engineers to provide you, your investments and facility with extremely safe chemical storage solutions. Built from heavy-gauge steel and made in the USA for maximum strength. All US Chemical Storage fire proof storage containers are hand-welded and tested before ever leaving our factory. When put up against the competition, US Chemical Storage wins every time. The foundation of our fire proof storage containers and non-fire proof chemical storage containers provides a stronger and more durable construction than the others. 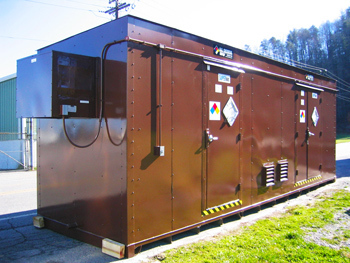 All of our chemical storage buildings are 100% compliant and 100% customizable to meet any specific requirement necessary. Our fire proof storage containers allow for Class 1A Flammable Chemical Storage and/or mixing of Class 1B Flammable Chemicals to occur closer to your facility. Increase your operational effectiveness with our 100% compliant and 100% customizable fire proof storage containers by US Chemical Storage. Flammable Liquid Storage Indoors – How to Remain Compliant?